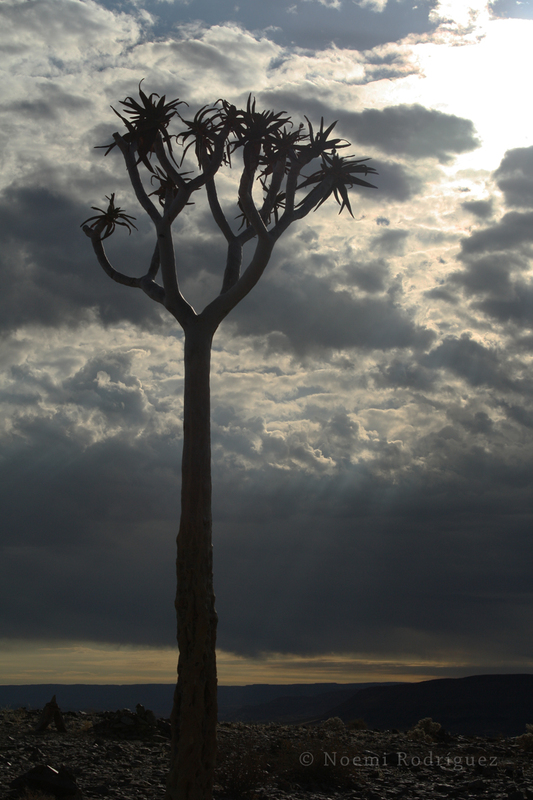 As soon as I was able to move pretty normally again, we left Swakopmund planning to visit some touristic attractions in Northern Namibia, before heading to Windhoek, the capital of Namibia. My friend wanted to see some wall paintings on the rocks, but it implied a long walk under the torrid Namibian sun at 40ºC/104ºF, so I decided to stay in the parking lot, reading and speaking with the workers, all of us trying to get some shade. When my friend came back, we gave the guide a ride to his village and it was funny to drive almost to the door of his hut. 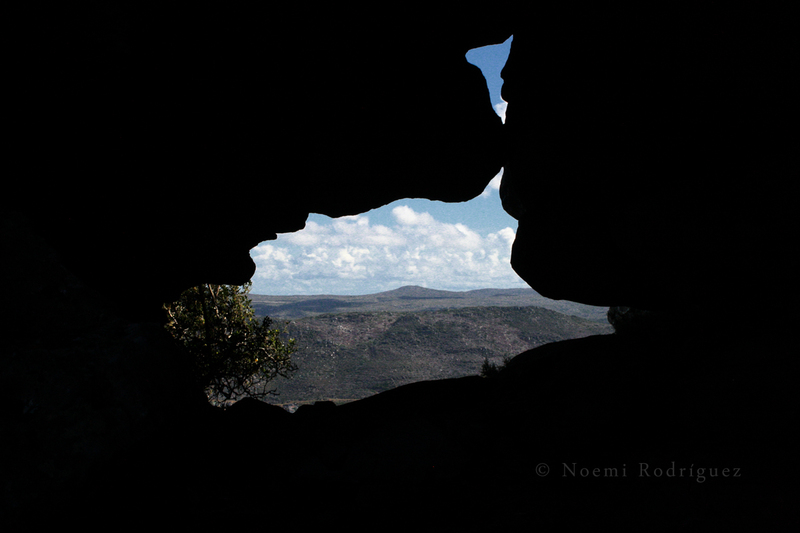 After hitting on me – which was an advance of what would happen later in Tanzania, the country where any white girl can find a husband- he entered his house and we left with the intention of seeing some rock formations. 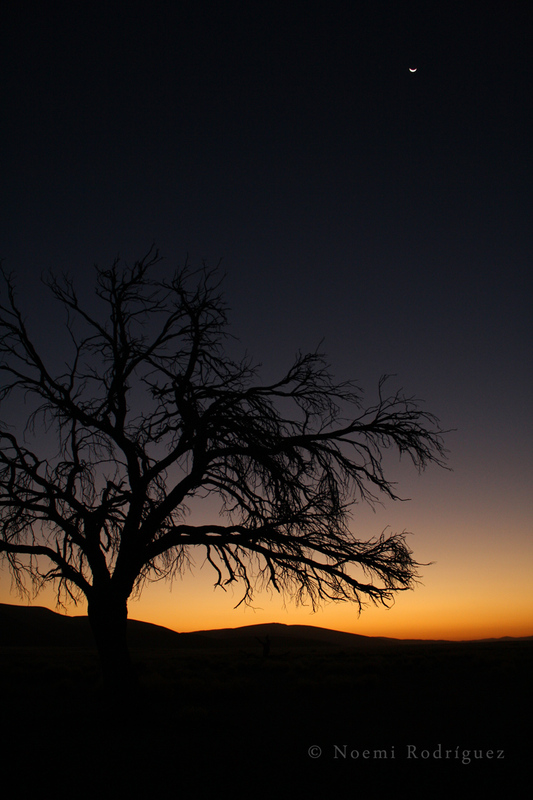 But nightfall came while we were driving and we pulled over to sleep in the car. 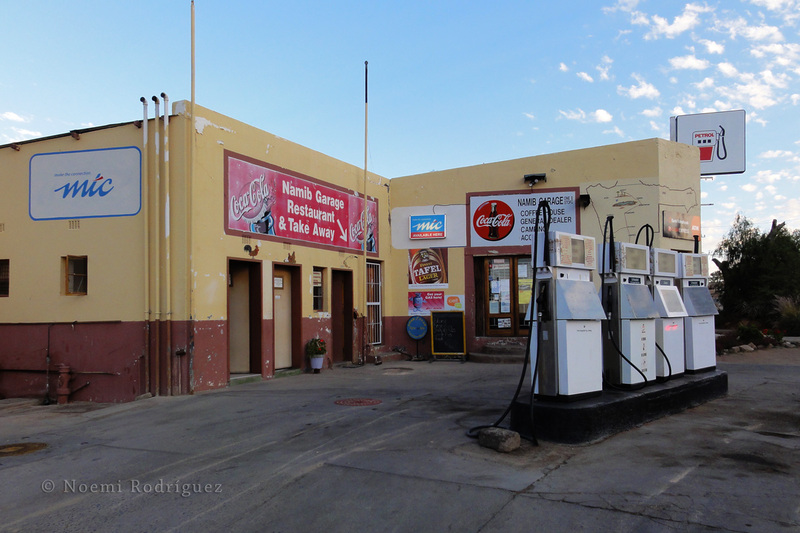 The next morning we realized we didn’t have enough gas for all the places we wanted to see – and it’s difficult to find gas in Northern Namibia – so we just visited the Petrified Forest, which wasn’t that great. 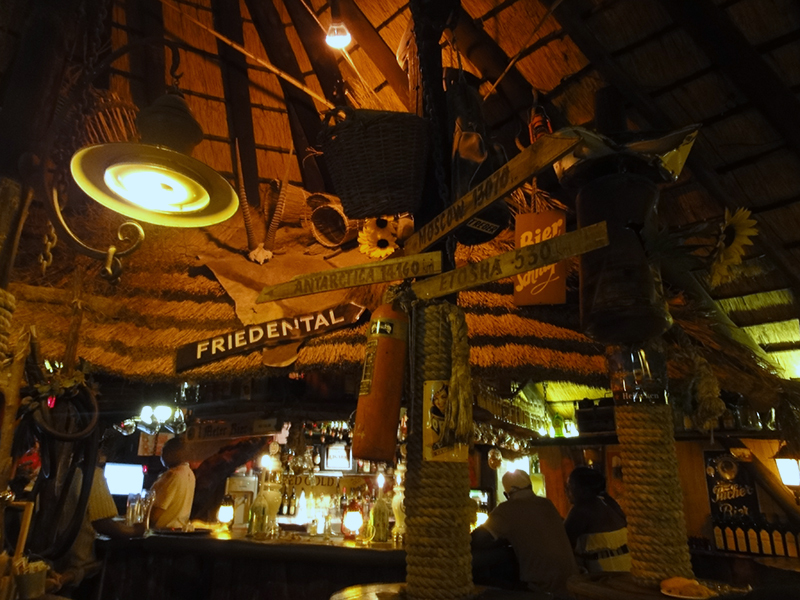 We gave another guide a lift , and we headed to Windhoek, where our Couch Surfing host was waiting for us. 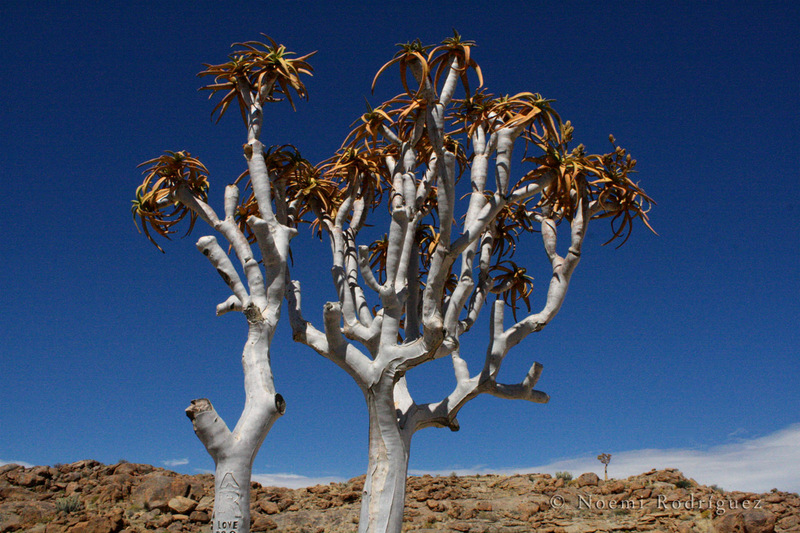 In Windhoek we had a taste of civilization again; it’s a very interesting city with lots of different cultures. Apart from English, people speak a dialect that sounds like a mix of German and Afrikaans, although I think it also has some Ovambo and Bantu influences. Our host took us to the local bar, Joe’s, where both black and white people enjoy good beer and meat. Namibians are very proud of their ‘Windhoek’ beer, which I have to admit was pretty good; it’s also pretty famous in Southern Africa. At Joe’s I tried Oryx meat, which was really tasty, although I couldn’t help thinking about the beautiful creature I had photographed in the desert a few days before. 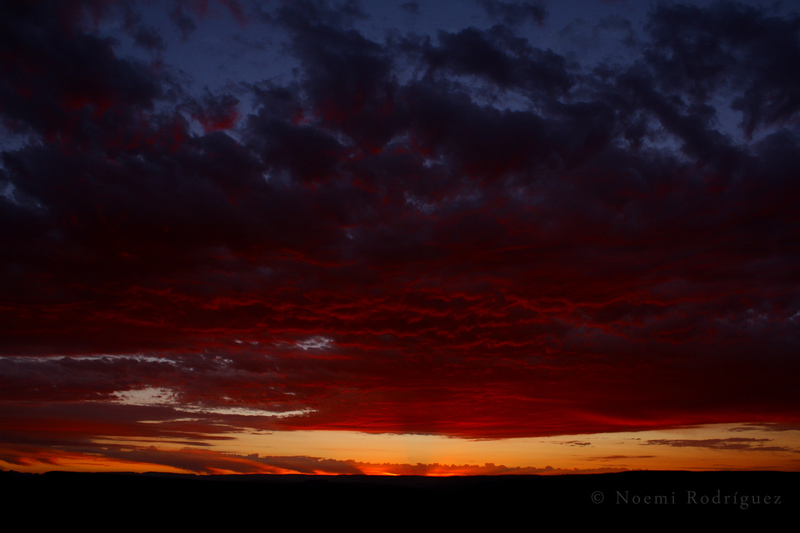 And the time came to leave Namibia! 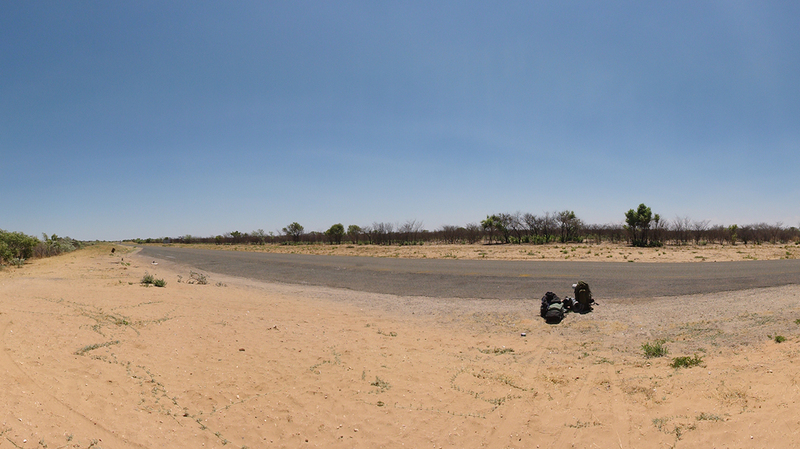 After returning our rental car in Windhoek, it was a difficult mission to find transport to Botswana. Finally we found a 6 a.m. minibus that took us from Windhoek, across the border, and to Ghanzi, in Botswana. 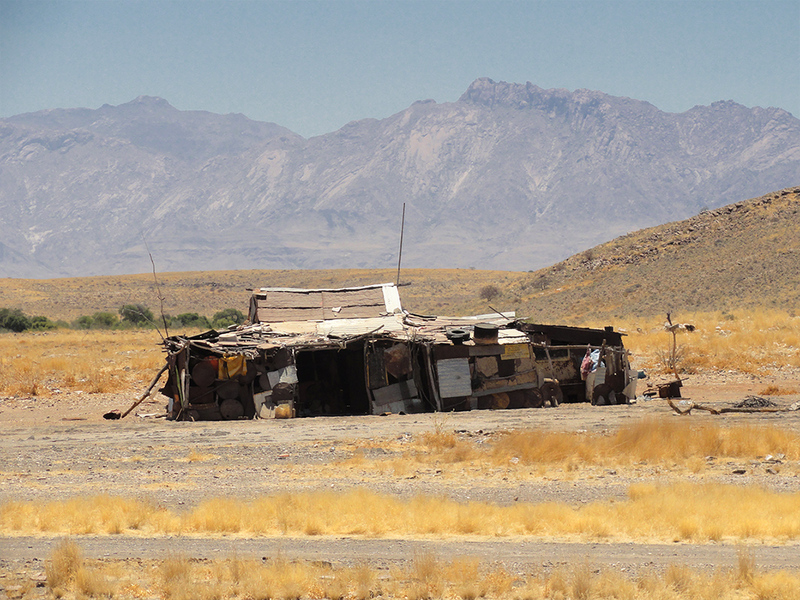 In the minibus we met ‘John John’ – I have no idea if that was his real name -, a white Ghanzian man. He offered to take us to town from the bus stop because it was in the middle of nowhere; his father would be coming later to pick him up. 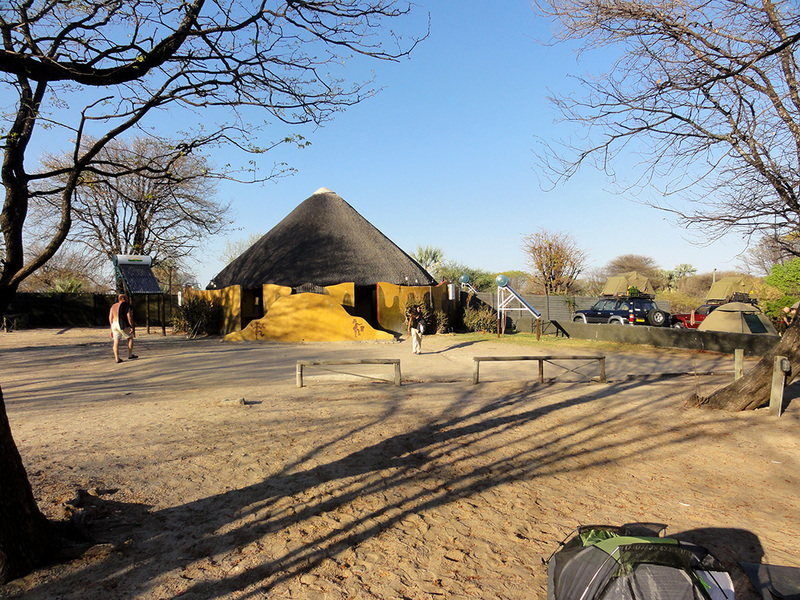 So they took us to Ghanzi and even offered to take us to Maun the next day, which was the place we needed to go to visit the Okavango Delta. 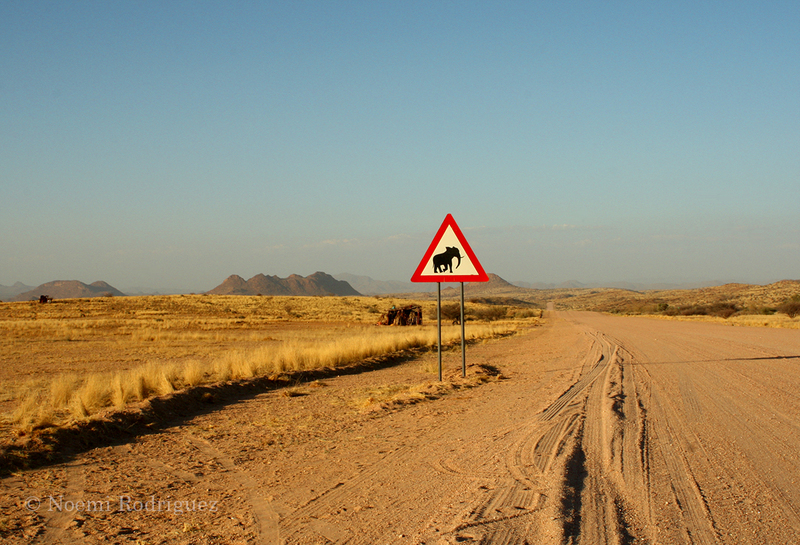 Due to subsequent experiences, I’m not afraid to claim that offering rides in Botswana – especially to white people – appears to be customary, even if the person who offers a ride is not what you could consider very friendly, but that’s just how it is. Since accepting that ride meant having to sleep at this man’s farm away from the city, we kindly declined the offer and took a local bus to Maun. Of course, the bus had around 40 seats and there were more than 100 people. I was already used to that, it felt like being back in South Africa. When we finally got to the camping site in Maun, a dip in the swimming pool was a taste of heaven after those 800km on that extremely hot day. It also allowed us to relax a bit before our next adventure: the Okavango Delta! 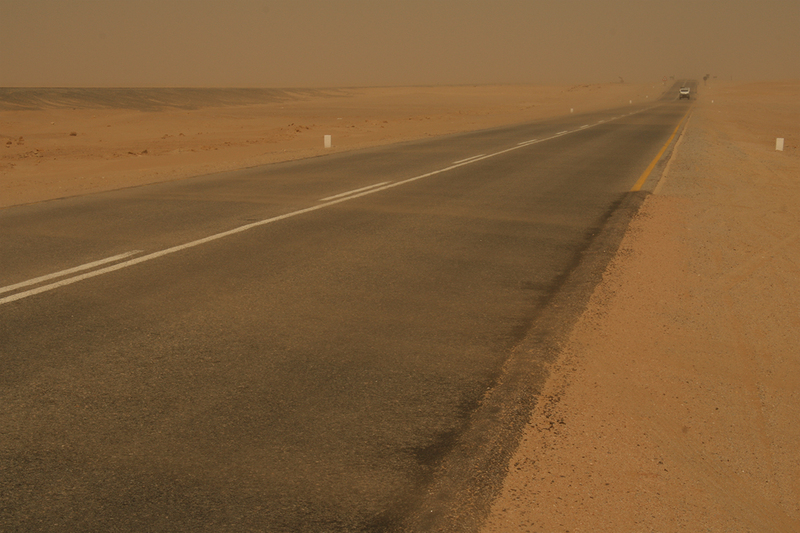 Saddened by our farewell to the desert, we drove through sand storms to Walvis Bay, the first place that looked like ‘civilization’ after a long time. 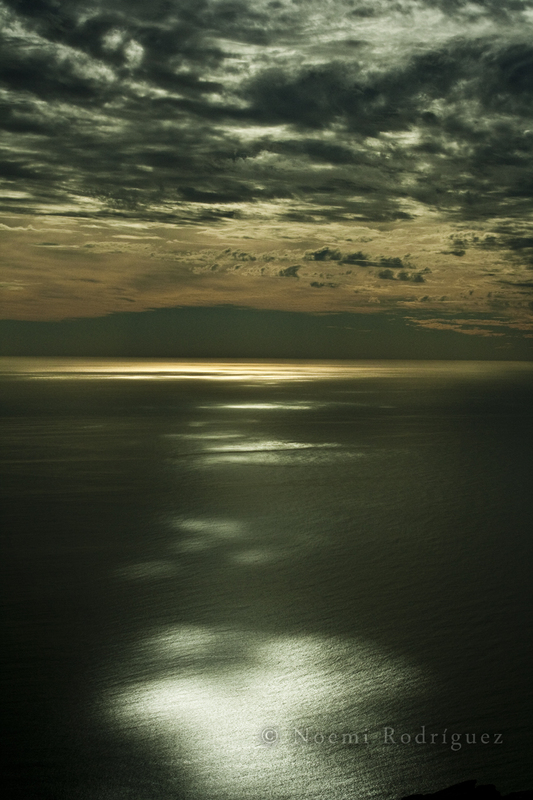 It was also the first time we were able to see and smell the ocean since we left South Africa. 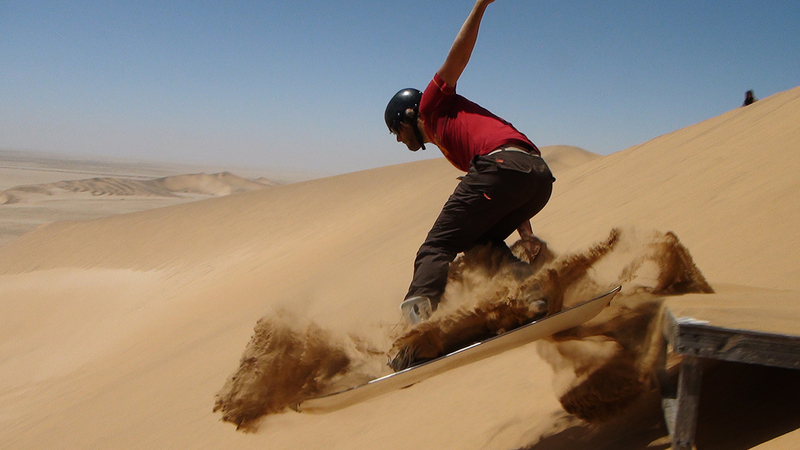 We ate a VISA-payed pizza -we couldn’t resist the temptation- and then kept driving towards Swakopmund, one of Africa’s most famous extreme sports capitals. Since we had plenty of time to get there, we stopped on the way and drove off the road to see some dunes that were next to the ocean – a beautiful mix of landscapes. After enjoying the view for a while, we returned to the car and tried to get out of there, but the car laughed at us. We were stuck in sand, and I don’t even know how that happened. The more we tried to get out, the more stuck we were. 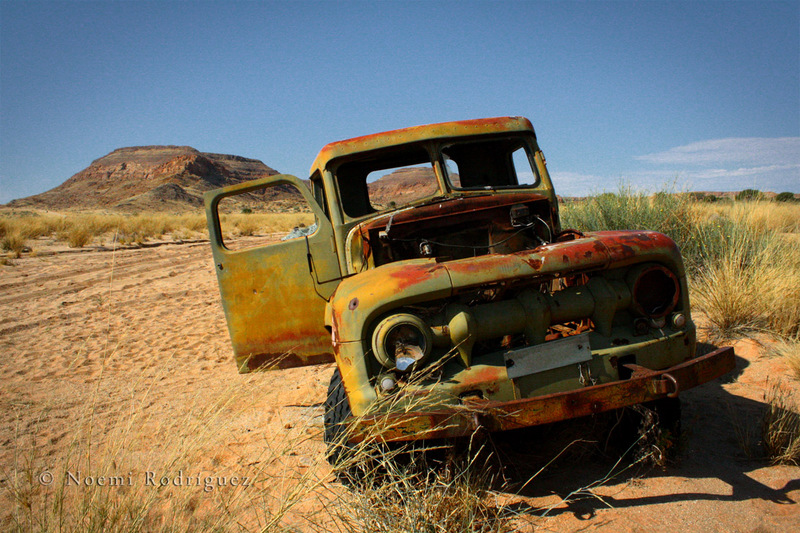 But suddenly, before we had time to laugh at our misfortune, a messenger of God came to rescue us in his pick-up truck! 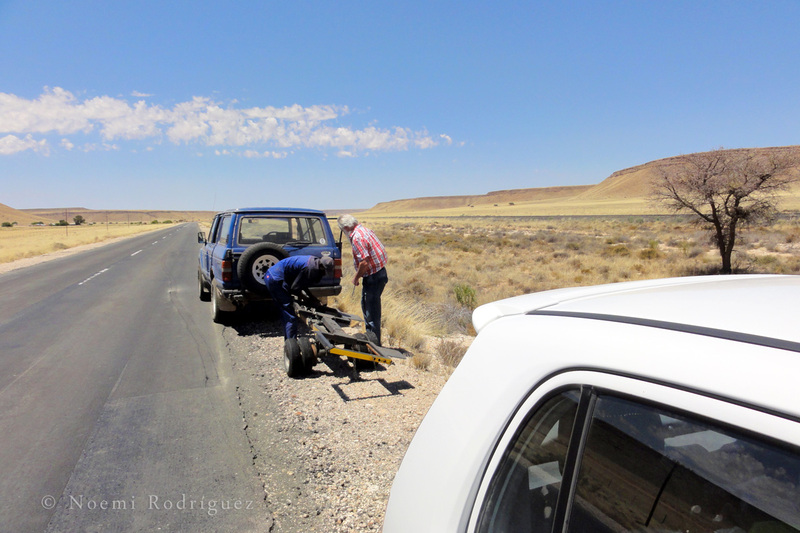 We hadn’t even been stuck for 5 minutes when he came, a Capetownian middle-aged man who had seen us from the road and thought we could be in trouble. And yeah, we were. But not only that, besides he just happened to have a rope and pulled us out in a second. It looked like he was used to save stupid tourists from their sandy deaths. After thanking him we continued our journey to Swakopmund, where we stayed at a cool backpackers, thinking we had escaped from the dangers of the sand. The next morning we decided to try sandboarding, which is exactly the same as snowboarding, but on sand. My friend was used to going snowboarding, but this world was completely new to me. We spent the morning going up and down the dunes, it was really fun! 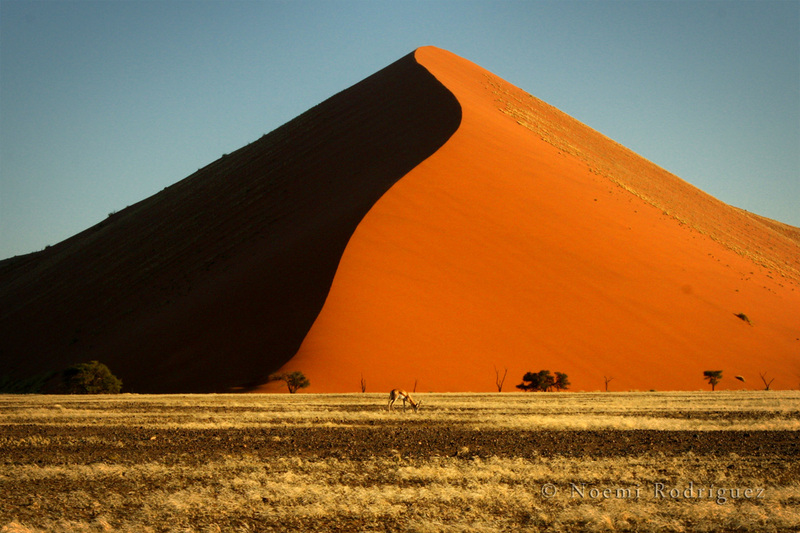 We couldn’t slide down many times, because to be able to do that you had to walk up the dune first, which wasn’t easy. But it was an interesting and enjoyable sport that I recommend you try if you have the chance. After all that adrenaline rush from the morning, my friend convinced me to try quad biking in the afternoon. Big mistake. 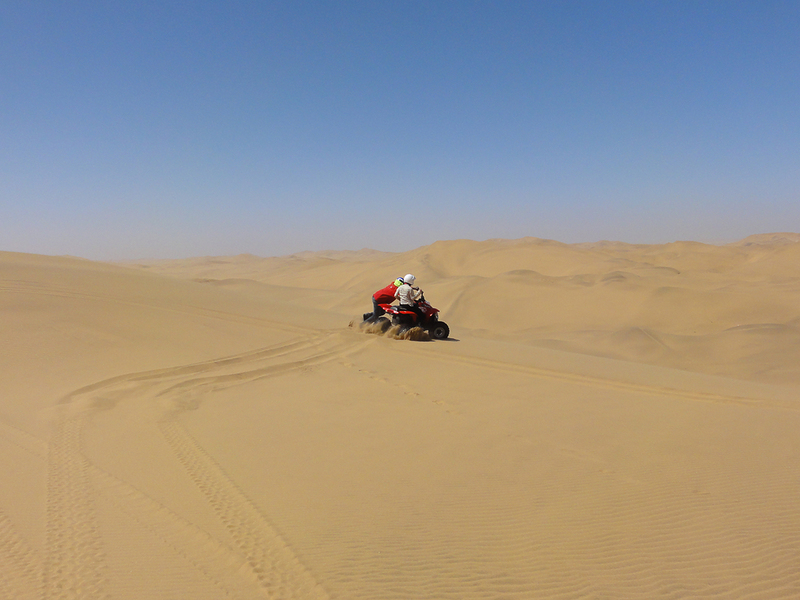 First of all, don’t use an automatic quad if you’re driving up and down the dunes, it gets stuck all the time. In flat areas was fun, though. 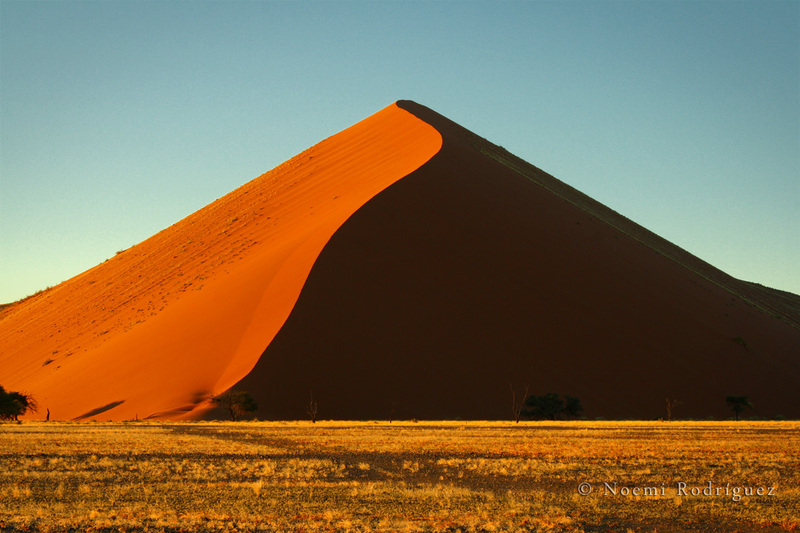 Secondly, if you see it’s getting stuck all the time, don’t try to go up a steep dune – it will get stuck and fall backwards. And that’s what happened to me. I fell backwards with the quad, which got the best part because it fell on top of me – lucky quad. As for me, having a 200-kilo-monster on my back, eating sand, being unable to breath, and having gasoline dripping on my face was not a nice experience. Those seconds before my friend and the guide got to me were never-ending. But the worst part came afterwards, when we had to go back to the quad station and the guide asked me to drive the quad back there, because we were pretty far away. So in pain and terrified of having another accident, I had to drive that monster back to its cage for what it looked like hours but I think it was 20 minutes. Of course, when there were high dunes I just left the quad there and walk – with difficulty -, and let the guide do his job. After that, I had to stay in bed with ice for a couple of days, which forced us to stay in Swakopmund a bit longer than we expected. Quad bikes: never again! 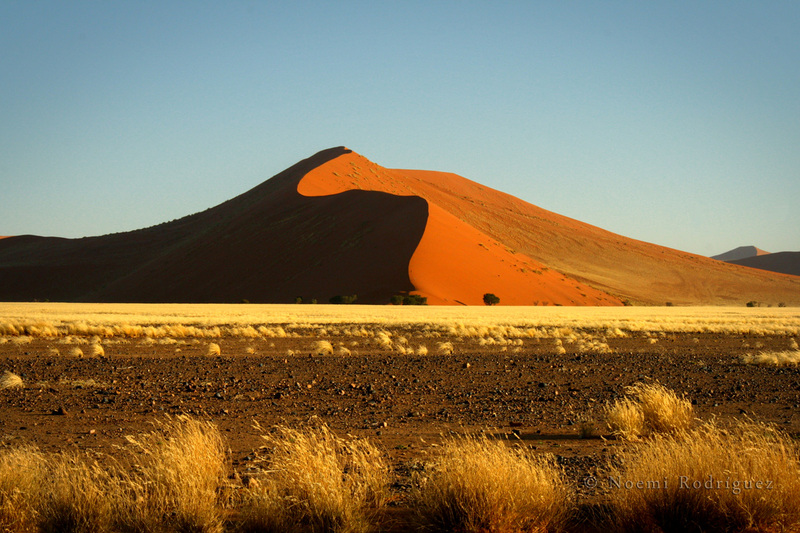 Since we were told that the only way to visit Namibia was by private vehicle, we rented a small car in Cape Town, with the intention of giving it back in Windhoek, the capital of Namibia. Even though returning it in another country entails paying an extra amount to the car rental company, renting a car in Windhoek with the same company was much more expensive than in Cape Town, so this was the cheapest way. 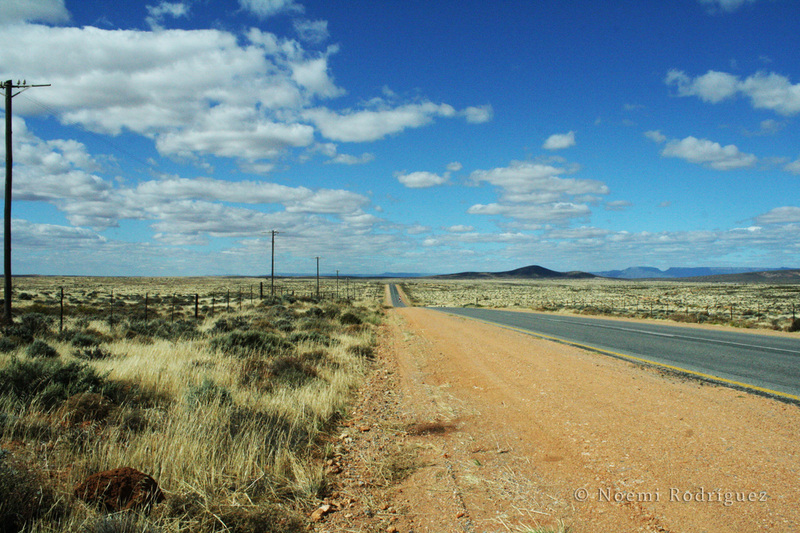 The first day we did around 600 km -about 370 miles- and slept at a camping site in Springbok, a little town on the northwestern part of South Africa, close to the border with Namibia. That’s where we started to notice the change of weather; the night was so cold that after a few hours trying to sleep I had to leave my tent and sleep inside the car. This was the first of many car-sleeping nights, sometimes because of the cold, sometimes because we didn’t want to spend more money. 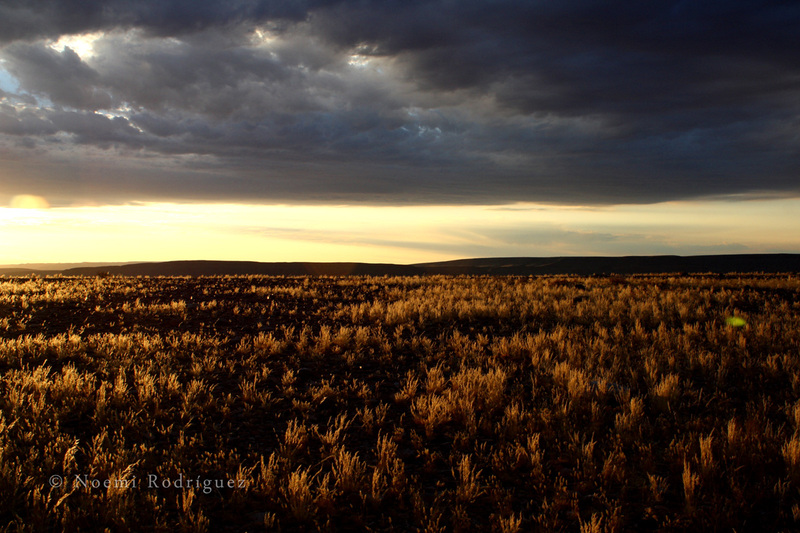 After crossing the border the next day, we drove through the dirt roads to Fish River Canyon. 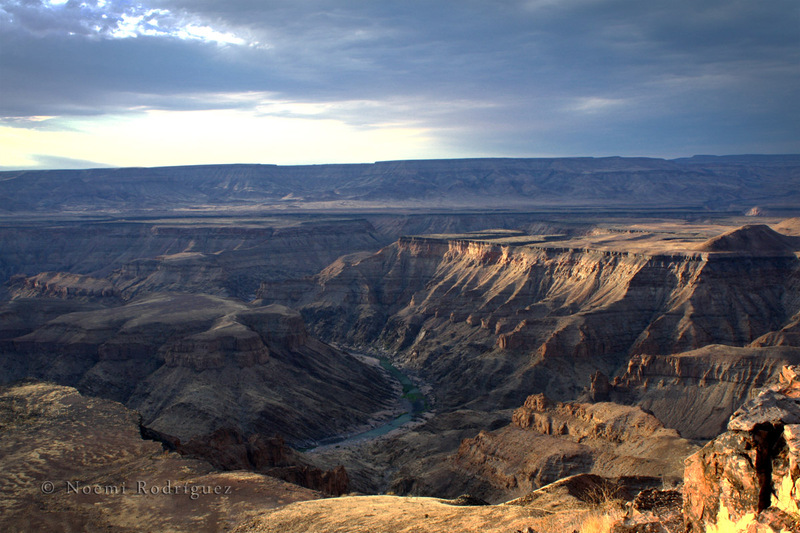 It is the largest canyon in Africa and the second largest in the world after Grand Canyon. 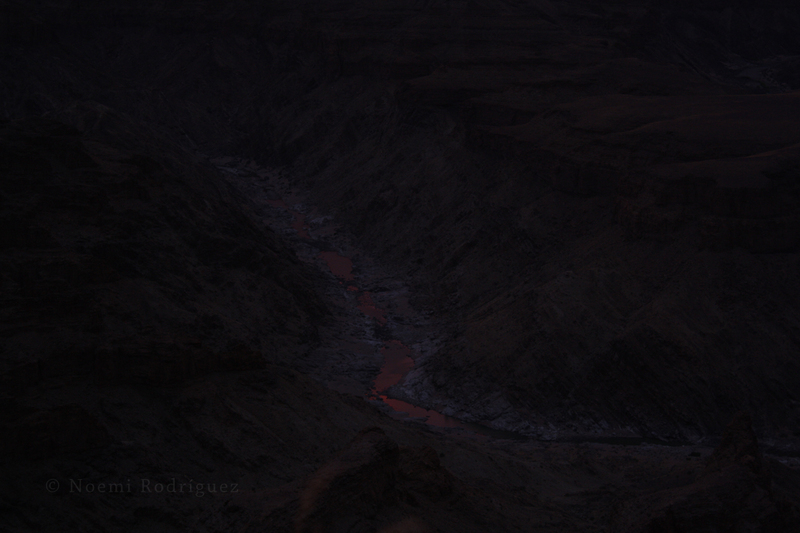 The view was spectacular, being in a place like that you feel really, really small. 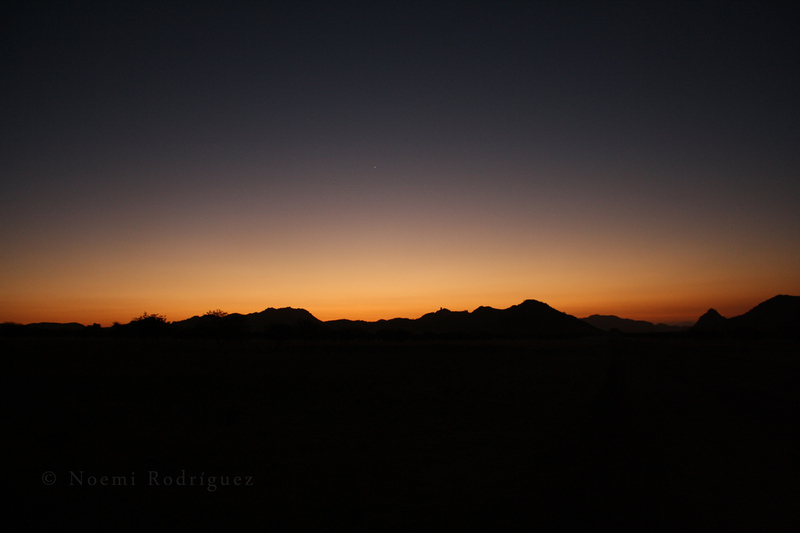 We watched a great sunset having a Windhoek (Namibian beer, quite tasty), and I convinced my friend to forget the camping site, stay there and make a bivouac under the starry Namibian sky. 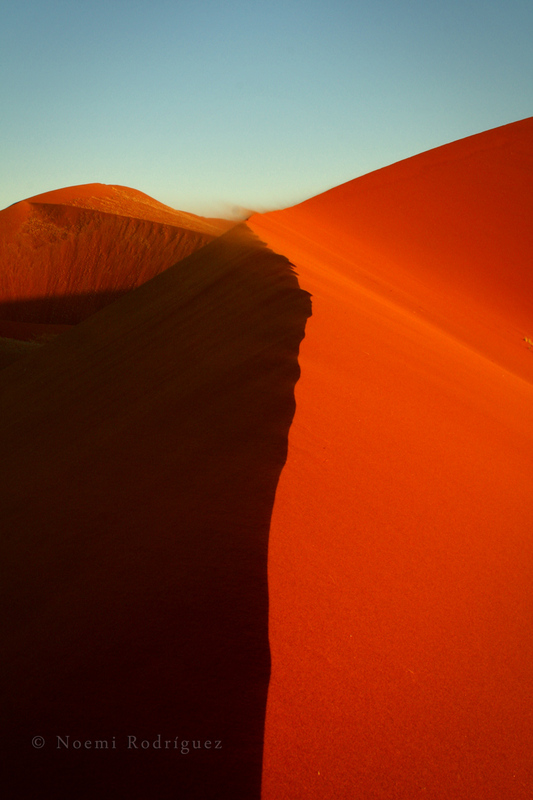 I have never seen as many starts as I saw there, and I doubt that I ever will.The night wasn’t as cold as in Springbok, and the sunrise was beautiful, although not as impressive as the sunset. We continued our journey towards the North through the dirt roads (forget about finding many paved roads in that country) and enjoying the deserted view. 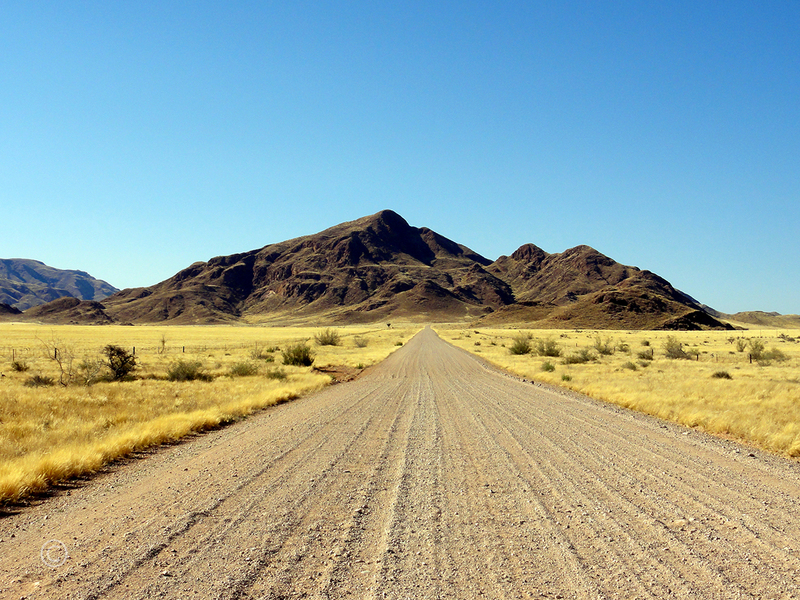 Namibia is a country of long, long roads without seeing anyone but a bunch of springboks, kudus or impalas jumping onto the road. The territory is theirs, after all, so we proceed cautiously. Everything was going great, but when we got to a burning hot paved road after hours of driving through the dirt roads… oh no. Yes. Flat tire. In the middle of nowhere. Ooook no worries, we have a spare one in the trunk. So let’s change it and continue the trip, we will go to the nearest town and try to buy another one. We found a ‘town’ called Aus, a super small town with just a few houses, but surprisingly there was a hotel, and a garage! So far, so good. We asked if they had tires for our car, but they didn’t have them that small (then we realized why generally people don’t use small cars in Namibia, because you can’t go anywhere with those tires), so it would take a day to order it from another town. We didn’t want to lose a whole day in that little village so we decided to go and pick up the tire from the ‘city’ where they would send it from, and later continue to the dunes. So we left Aus without a spare tire. Big mistake. 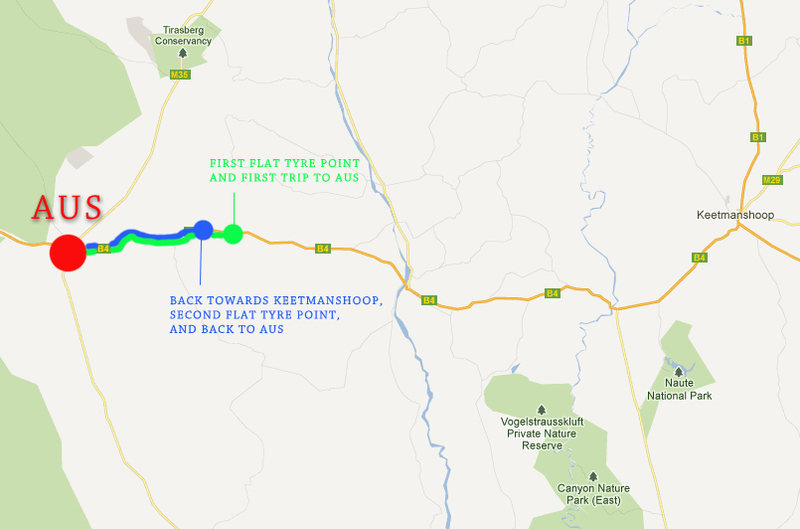 We took the road that we had taken to Aus, back towards the East, and after 35 km we got another flat tire. More or less at the same point where we had had the previous one. I couldn’t help but to burst into laughter, but my friend didn’t find it that funny. 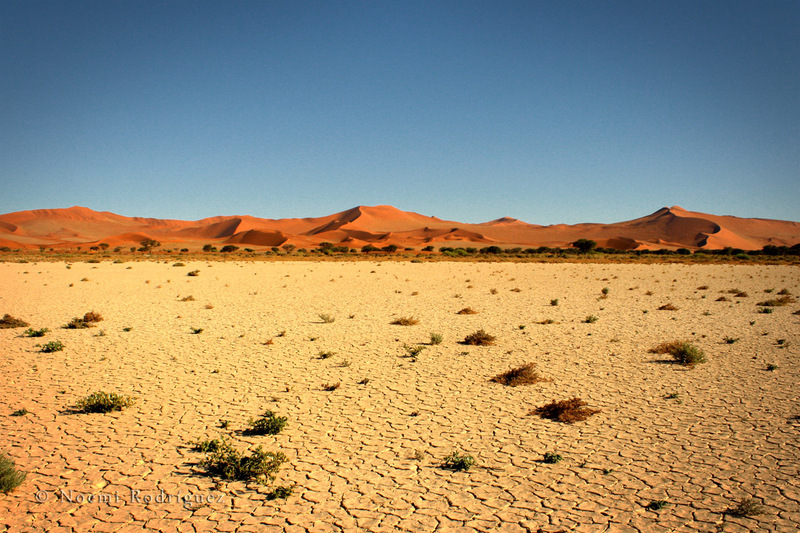 We were really in the middle of nowhere; the nearest town was 35km away; the desert sun was hitting hard; and we probably didn’t have more than 2 litres of water. But I was super calmed down (I guess my time in Africa had already affected me), and I decided to check out the Lonely Planet to see if I could find anything. Bingo! The phone number of the garage we had just been to. Thank God! And thank you Lonely Planet. So we called them and it was more or less like this: “Hey… do you remember the Europeans that just stopped by looking for a tire? Well… we have a situation here, could you come and pick us up?” They said yes, but you know, African time… so after a quite long nap in the car they finally arrived with a 4×4 turned into a tow truck, and we headed back to Aus… again. This time we accepted our destiny and stayed there until our tire came the next day, but everything happens for a reason… I was able to have my first shower in three days! 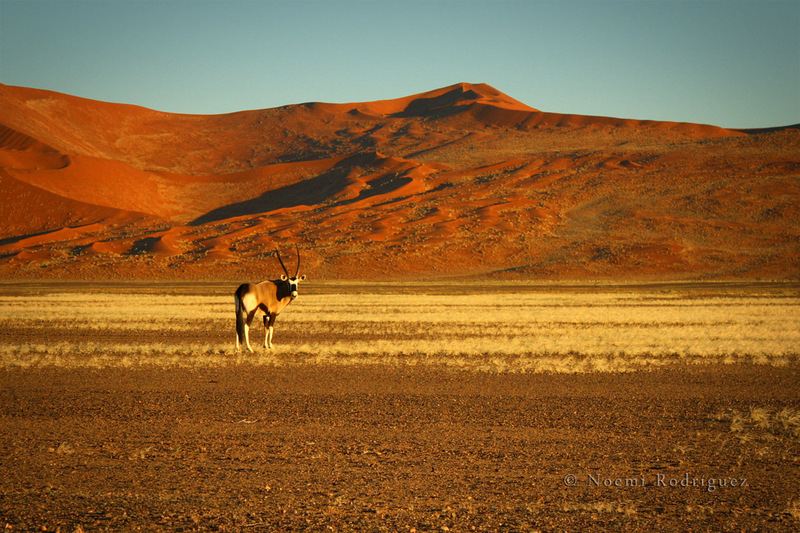 No other place has impressed me as much as Namibia did. 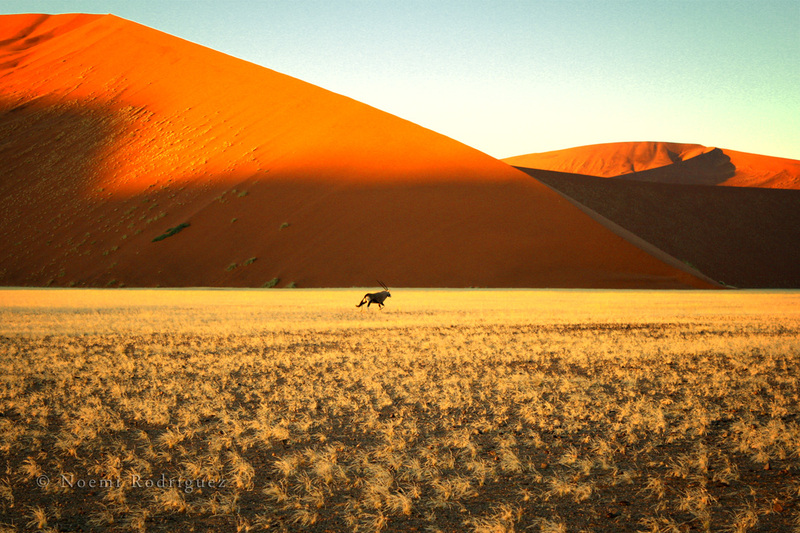 This vast territory contains thousands of kilometers of emptiness and peace, sometimes with a small surprise when a group of springboks jump in front of the car, or maybe a giraffe that has lost her family, or an elephant if you’re “lucky” enough. In some places you can drive for an entire day without finding any other cars. 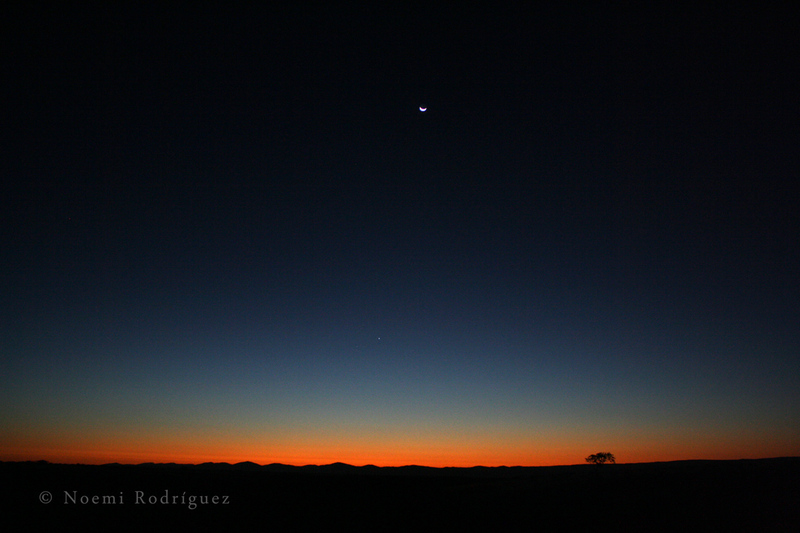 And the colors… the most amazing colors I’ve ever seen: the orange fire of the desert; the bright purple, red and orange of the sunsets; and the beautiful white sky at night, full with the powerful light of the stars everywhere you look, without any kind of light pollution. 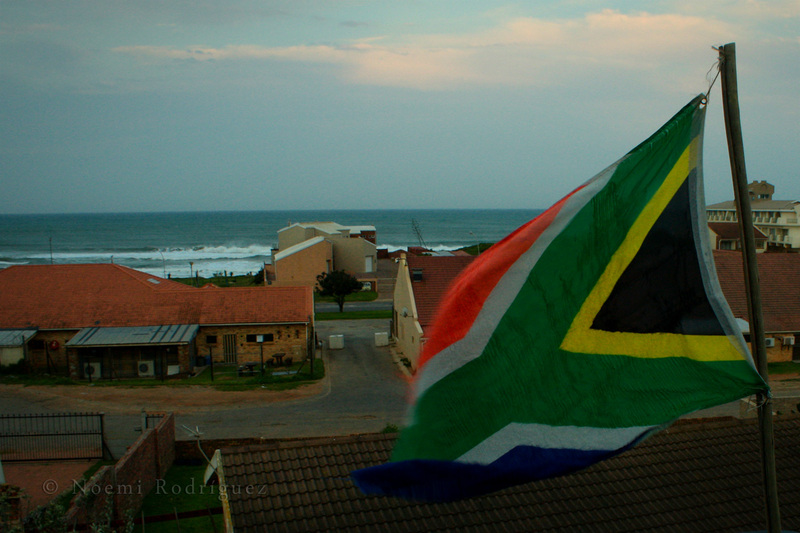 The time had arrived for me to leave the beautiful South Africa. But I wasn’t leaving for good, I would return to stay for another month at the end of my trip. Nowadays, South Africa is a really interesting country to live in. It has the baggage of the apartheid still present for its citizens, but it’s evolving into a more European way of thinking, although it’s still completely different. In a country like this, to act in the correct manner is a daily challenge. The way young people react to their parents’ and grandparents’ history is what is changing the future of the country. I’m fascinated by the idea of having that much power in the country’s path, like the one youngsters must have had after the segregation in the United States or after Franco’s death in Spain. But the end of the apartheid was more recent than those examples, and you can still feel it in the air when you visit South Africa. 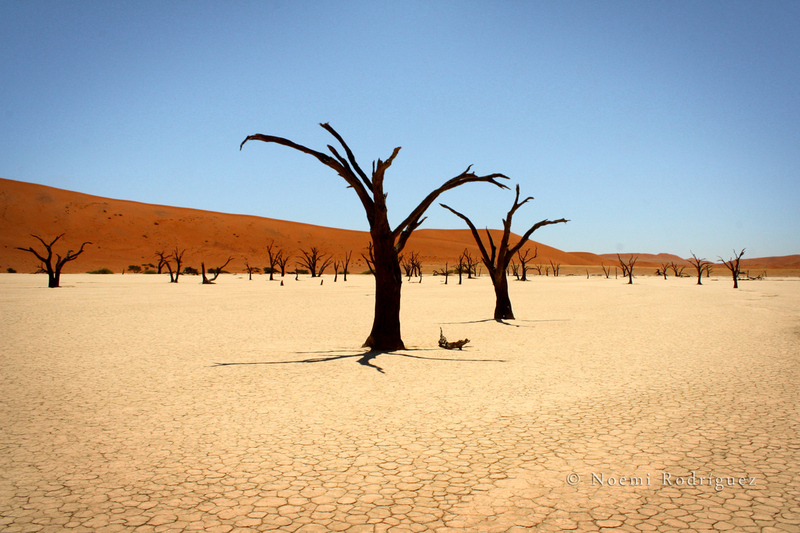 My next stop was going to be Namibia. 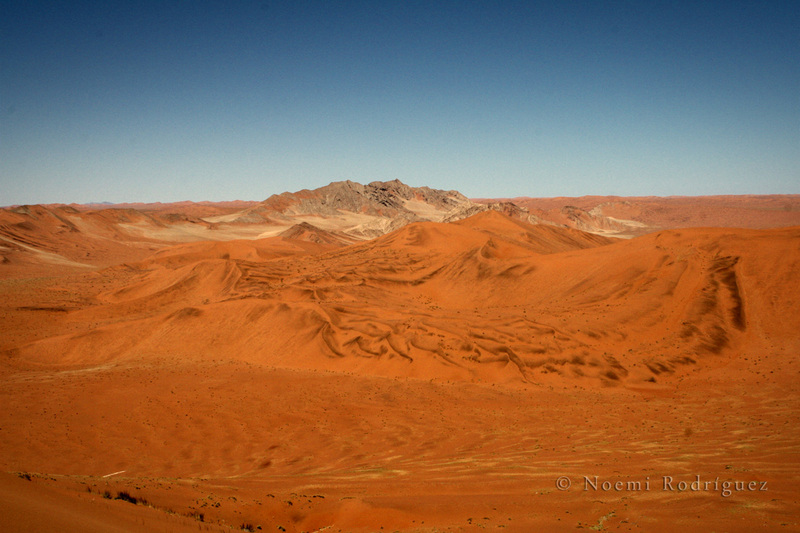 I had decided to travel through Namibia by car because everybody had told me that it was the only option, so I spoke with the Norwegian guy that I’d met on my trip from Hermanus, Dag, and since he was heading in the same direction, we decided to rent a car together. Despite my search for more companions to share the costs, no one answered my ads, so it was just the two of us. Before leaving we paid a visit to Kalk Bay (actually, my third visit to this place), a tiny fishing village where you can eat tasty fish & chips. When the fishermen arrive in the mornings with their catch from the night before, the townspeople go to the docks to buy fresh fish. 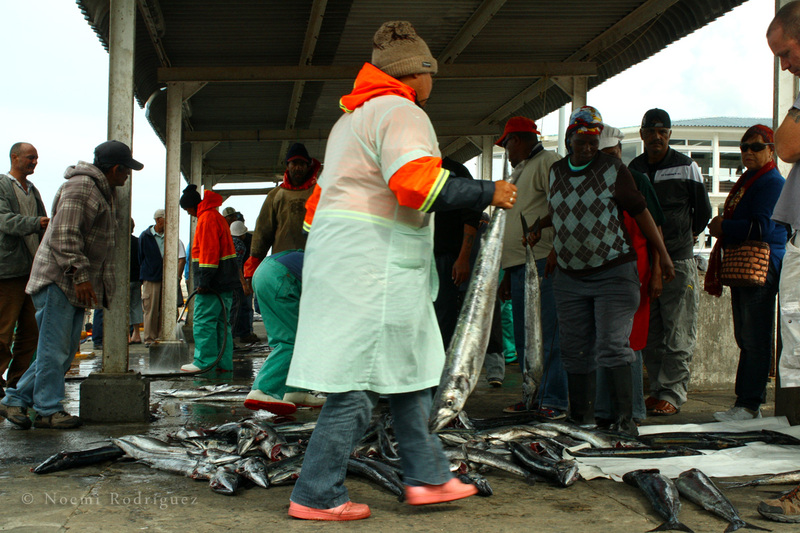 The fishermen throw the fish onto the floor and everybody walks around looking for the best pieces. The fishermen’s wives cut the fish before selling it, and then they throw the guts back into the sea where eager seals congregate waiting for food. 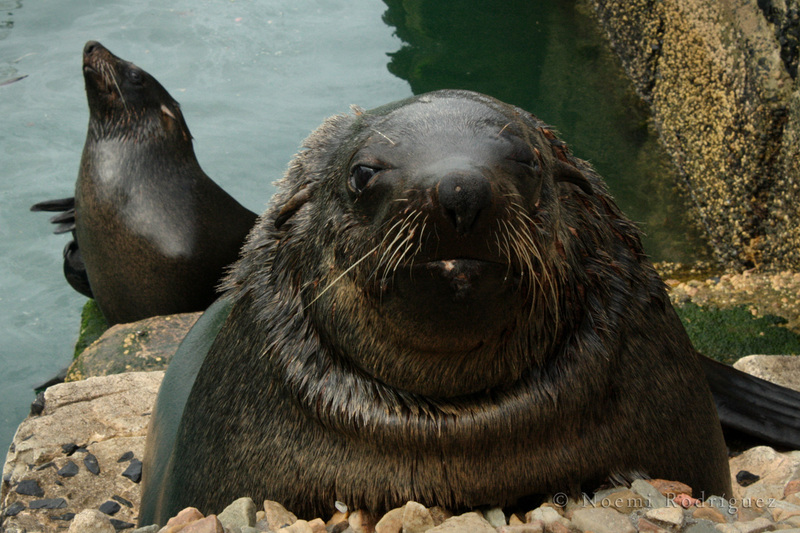 Apart from being a fishing village, Kalk Bay is full of natural jewels. 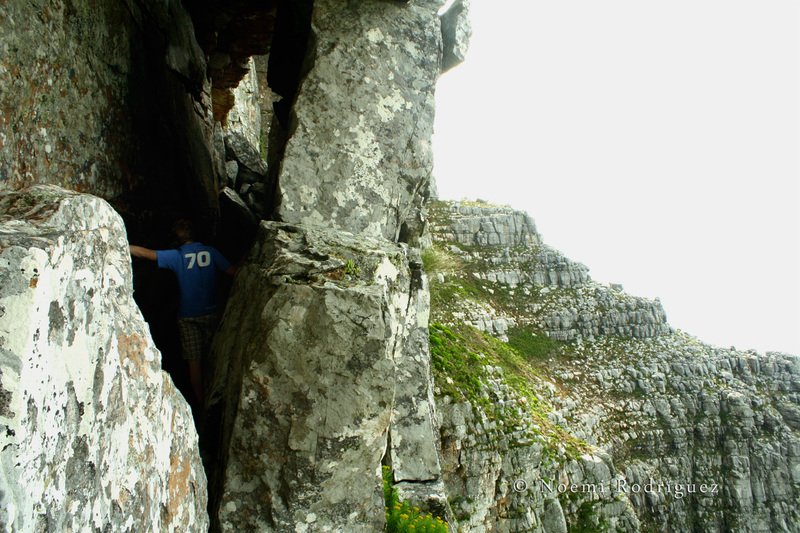 Many hiking trails run along its beautiful hills, and on these hills we made an interesting discovery: Kalk Bay caves. 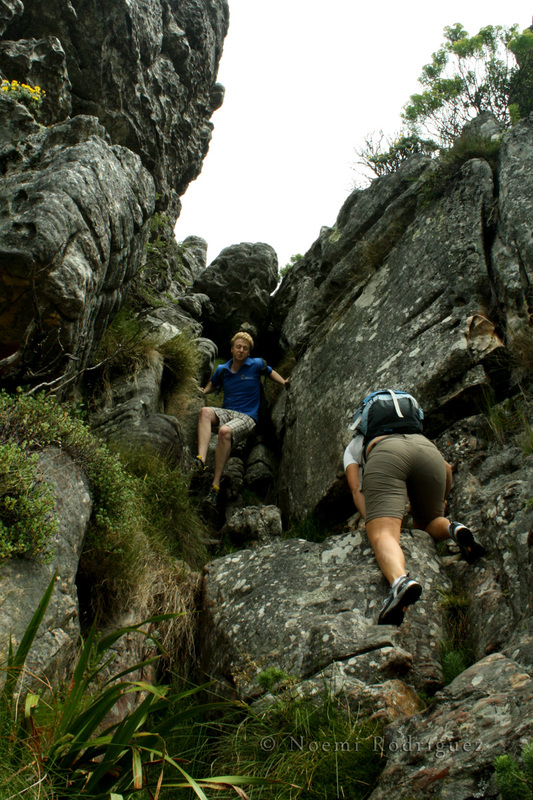 We crawled into some of them, but the most impressive and the biggest one was Boomslang cave. Boomslang cave is a dark long cave, with a chamber full of bats where you have to minimize the noise to avoid disturbing the bats. Its length is 506m, so imagine getting lost here! Fortunately we had a book with some hiking trails that my friends had lent me and it had directions about how to get out of the cave, and we had headlights. 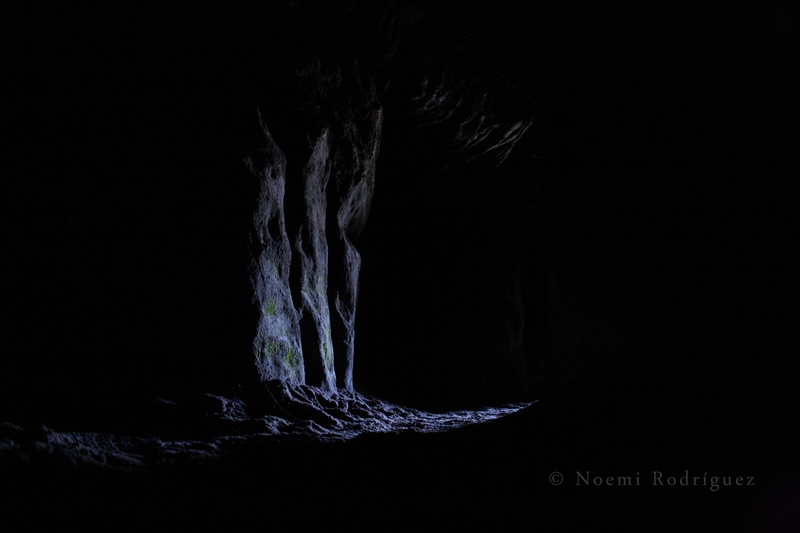 Crawling around the cave and discovering secret spots was an exciting experience, and listening to the silence inside a huge dark chamber with just the light of a candle we found there, was magical. 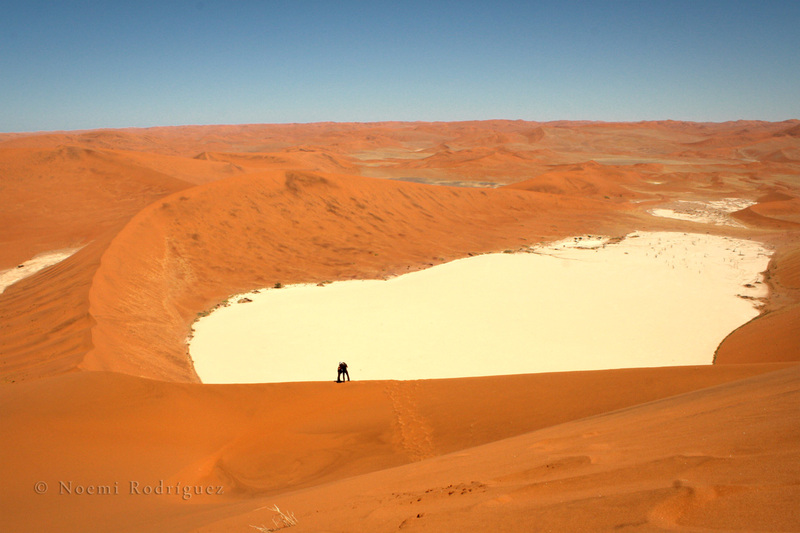 After this last excursion, we were ready to face the next challenge: the unknown and difficult Namibia. It was going to be an adventure we would never forget. The moment had arrived! 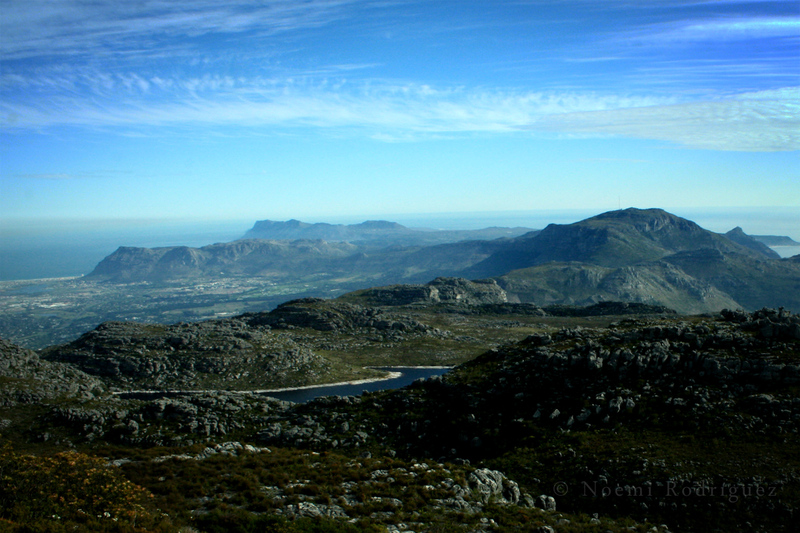 After one entire week waiting for the perennial cloud on top of Table Mountain to go away, the wonderful and clear sky of Friday, the 21st of October, 2011 was challenging me to try to reach it! Unfortunately before that, I had to spend half of the morning walking around Cape Town putting ads at the backpacker’s trying to find people to rent a car to Namibia, since everyone I’d met had told me that public transport in Namibia was inexistent and that the car was my only option. So against my first impulses of thinking that I could go across the country by hitchhiking, I surrendered to the idea that I was going to need a bit of commitment. And I’m glad I did it, because they were right! There was no public transport and in some places you can’t see any cars for an hour or more. But back to the mountain story. After ‘working’ in the companions’ search, I met a capetownian couchsurfer and a German girl and travelled in the back of a pick-up truck (or bakkie as they call them in South Africa) on my way to the gorgeous mountain. 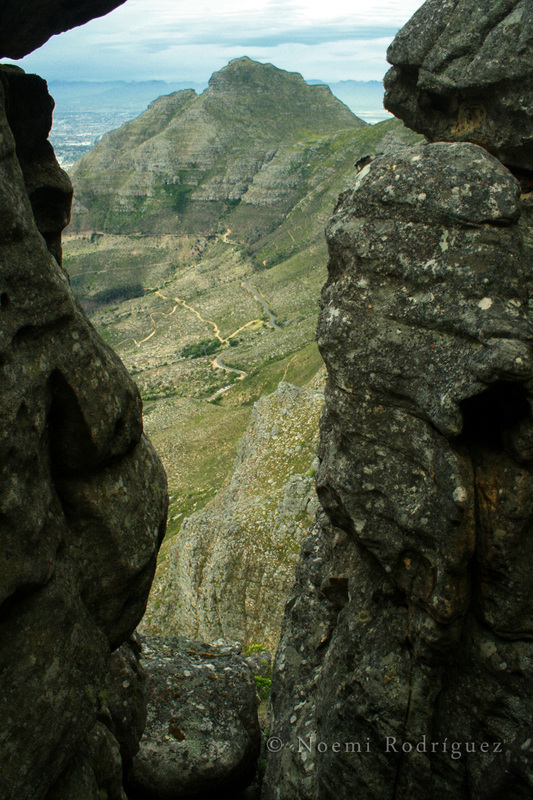 This capetownian mountain goat, Patrick, didn’t take us up the mountain by the normal route, but by the difficult climbing route, known as the India Venster (‘India window’ in Afrikaans and Dutch). The route passes along an area called the India Ravine, which has this name because it resembles the shape of India when it’s viewed from below. So after passing some warning signs saying “extremely dangerous route with steep rock climbing and difficult navigation”, we started our way up and after a long and steep hill we got to the climbing part. And I enjoyed it a lot! I discovered that the more difficult it was the more fun I had, and I wasn’t bad at it! I was a goat too and I loved it! We continued climbing up until half way, where Patrick told us that we could take a detour along the precipice to enter some cracks on the main mountain wall. The German girl didn’t like the idea of establishing October 21st 2011 as the date of her decease, so she waited on us and ate some snacks, much less risky (from her point of view, because she could have choked on an olive bone and nobody would have been there to save her). 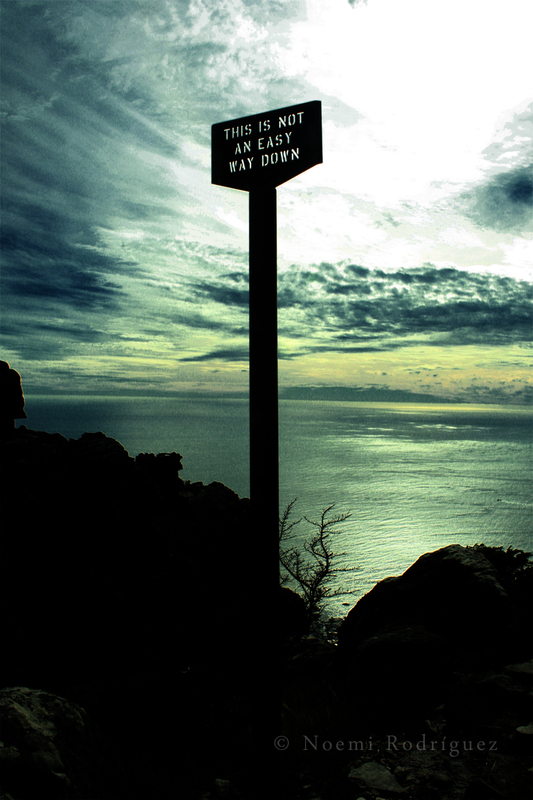 And there we went, along the precipice with a wonderful view of Cape Town and on a beautiful, sunny day. The rocks that were falling down while we walked couldn’t cloud the happiness I was feeling. 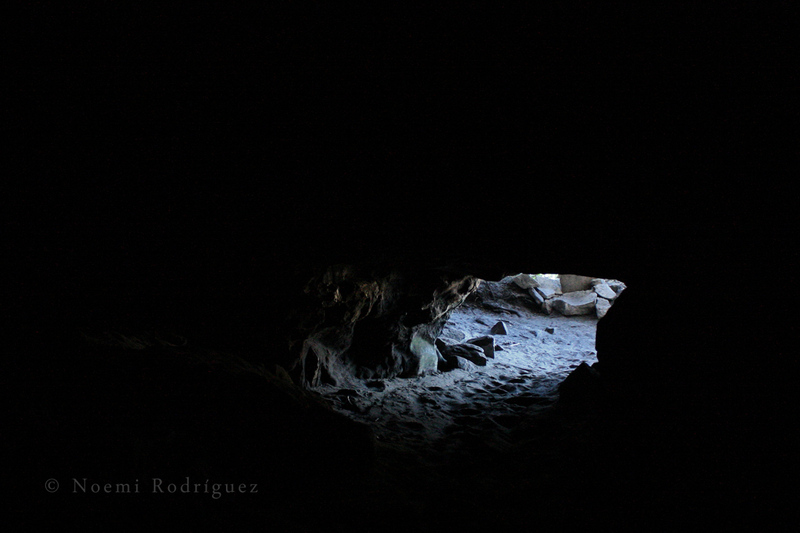 After a while we arrived to the crack in the wall and crawled inside. The sensation of being inside the mountain was amazing. Peace and quietness surrounded us, we could feel the breath of the mountain, and she was talking to us. I enjoyed every second of this experience. Then we went back to retrieve our hiking companion; she was still alive and happy! 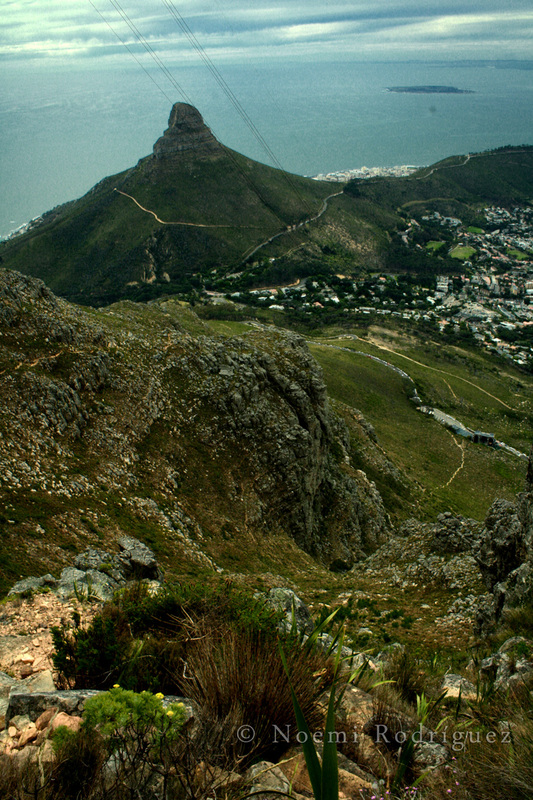 So we continued to alternate hiking with climbing, and eventually we arrived at the top of Table Mountain. The summit welcomed us with astonishing views, which we enjoyed while devouring our sandwiches. We walked along the summit, and it definitely lives up to its name, because it’s an enormous and absolutely flat table. We had to share it with the high number of tourists that were coming up the cable car, because whether you like it or not, it’s one of the city’s tourist attractions. Since we watched a bit of the sunset from the top, we went down when it was getting dark, and got to the bottom at night. Luckily our guide had a flashlight! But being lit by the city lights as we walked down was a great experience. And that was the end of my love relationship with a mountain, but I’m sure someday I’ll hike it up again, and of course I’ll take the same route! !